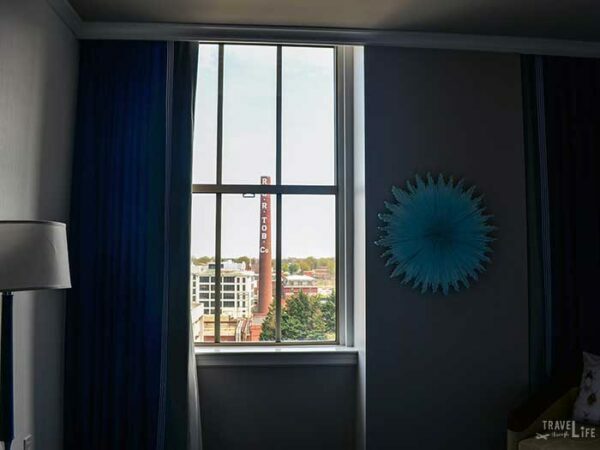 The Cardinal Hotel in Winston-Salem combines the iconic and historic Reynolds Building with Kimpton, a brand known for designing more than a place to stay. 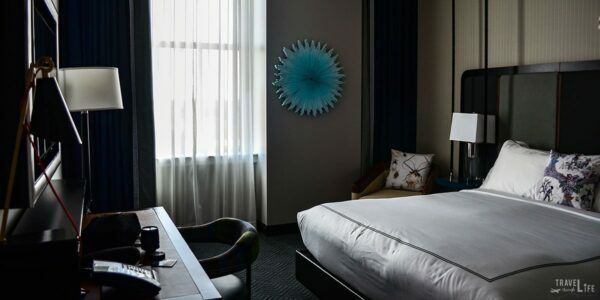 There is really no reason for you to leave when staying at this Piedmont hotel, but if you must, The Cardinal Hotel is surrounded by tons of fun and great for a weekend in Winston-Salem. Before we even dare set foot outside this magnificent building, let’s explore one of our favorite hotels in North Carolina from top to bottom (literally) and share exactly what you’ll find there, and why we’ll be back. We didn’t lie. The Cardinal Hotel is one of our favorite places to stay in North Carolina and we wrote about it here! Before it became a Winston-Salem hotel, R.J. Reynolds Tobacco Company called this Art Deco skyscraper home from its construction in 1929 through the 1970s. The Reynolds Building might look familiar to you because its architects (Shreve & Lamb) went on to build a larger version, which we call the Empire State Building in New York City. 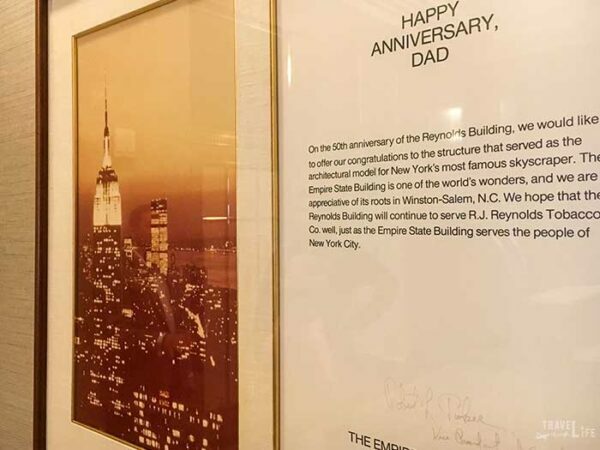 You can even see a Father’s Day card addressed to the Reynolds Building from the staff in New York just beyond the first floor elevators. Note: Historic significance and extravagance of building materials (including black marble from Belgium and gold leaf-festooned lobby ceiling) also landed this place on the National Register of Historic Places as of 2014. Also, tobacco may run through all the historic veins of the building, but it is now smoke-free for visitors. If you came to this hotel sleep, you can. But I would recommend you get out and enjoy at least a few of these carefully designed amenities. In true Kimpton style, The Cardinal Hotel (named for North Carolina’s state bird) is much more than a place to stay. 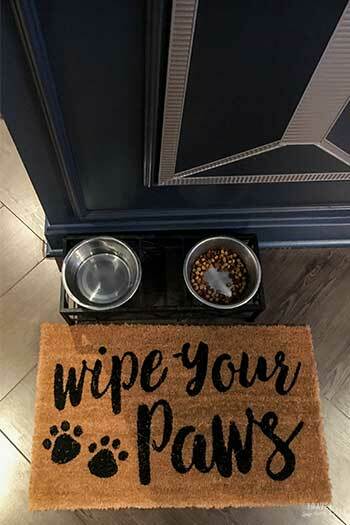 The downstairs living room is perfect for morning coffee, early evening wine, or food and water for your dog throughout the day and night. 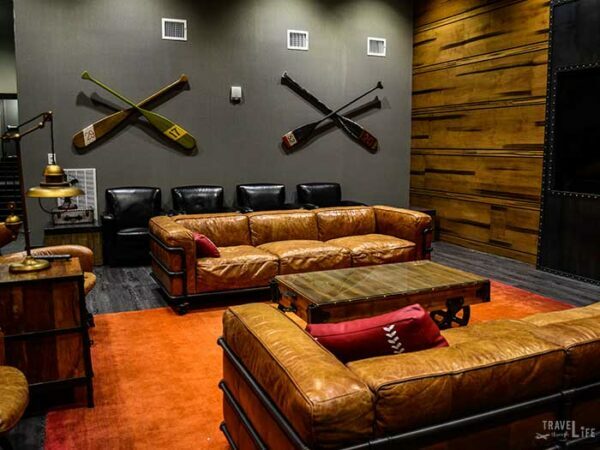 Even the basement is worth exploring, as you’ll find when bowling (yes, bowling! ), shooting hoops or playing table tennis in the recreation area. There’s also a shuffleboard table, chess set, and a gigantic scrabble board. 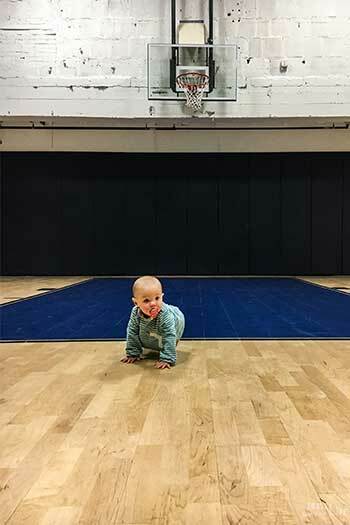 But who’s keeping score, really? 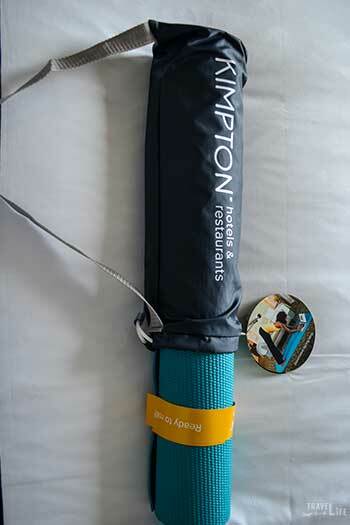 One more cool feature I like about Kimpton is their “Forgot it? We got it!” lifesaver. We mistakenly left our toothpaste at home and they graciously gave us a travel-sized replacement free of charge. Things you can borrow include a yoga mat, an umbrella, and more. To me, that’s how service should be! Or you can just chill out in your room with a really nice view out your window. The views from our side were very nice, overlooking the Wake Forest Innovation Quarter and R.J. Reynolds smokestack and former power plant. Our little one was happy with the super comfy bed, even if she ended up sleeping in her pack n’ play, which we placed on another side of the room. In front of the bed, there’s a nice desk for getting work done and a huge TV above it for when you lounge and binge-watch something fun. If you want to book a night at The Cardinal Hotel, you can check TripAdvisor, like we do, to see all pricing options out there. We suggest you book direct, in case something comes up or you have to postpone your visit. You can do that after comparing or through The Cardinal Hotel’s website. 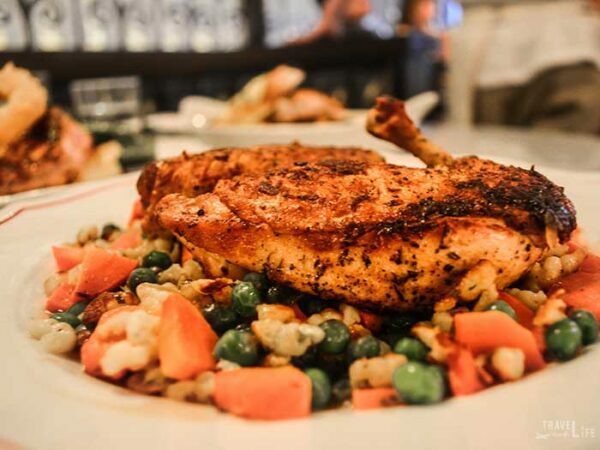 The Katharine (Named after R.J. Reynolds’ wife) is the on-site Brasserie where you’ll partake in one of the best food experiences a person will ever find. Executive Chef Adam Barnett and his team are doing something special here and we were lucky enough to experience the magic. I don’t want to tell you what to eat, but you should at least start with some oysters, escargot, charcuterie, and their pan-fried chicken with spaetzle. Whoops! Maybe I did tell you after all! You’ll thank me later. You can learn more about Katharine through Michele Gillespie’s Partners of Fortune in the Making of the New South. If you’re having a wedding, business meeting or any other type of social gathering to put together, The Cardinal’s massive meeting space can easily accommodate. 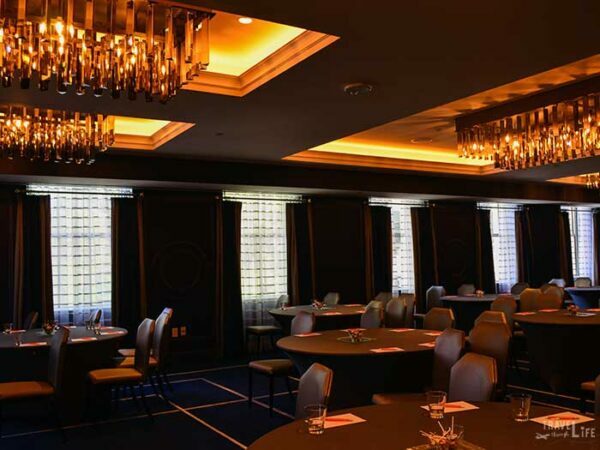 With over 6,000 square feet of meeting spaces available, you can start on the ground or go all the way up to the 20th floor. I’m partial to the latter, considering you can see the entire city and as far as Pilot Mountain and Hanging Rock State Park on clear days. Looking for fun things to do in Winston-Salem outside this fun hotel? 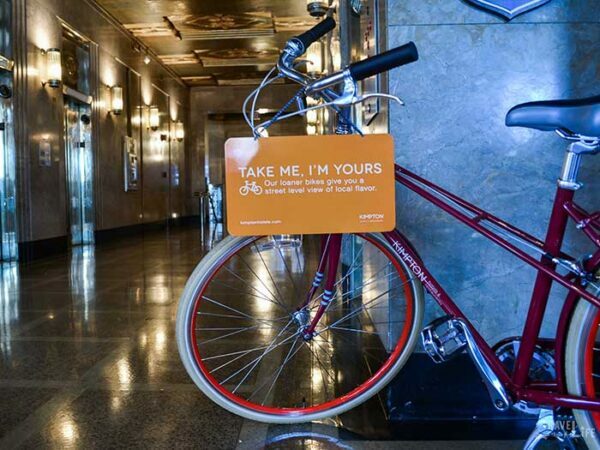 You’re within a short walk or bike ride (check lobby for loaner availability) from the Downtown Arts District and tons of cool restaurants. Winston-Salem represents well in the Triad’s and North Carolina’s beer scene and I’d recommend a trip to at least Foothills Brewing and Small Batch Beer Co. Take a minute to relax more and visit Reynolda Village, a beautiful historic home and garden designed by Katharine and RJ Reynolds. Spend time at Old Salem and go back to early America. We even came up with eight ways to explore Old Salem. By the way, all of these fun things made our guide to a weekend in Winston-Salem! We’re smitten by The Cardinal Hotel’s homey interior, wonderful service, and delicious creations coming out of the Katharine. Hopefully, you can visit the Empire State Building’s father and witness exactly what we experienced. Have you ever spent time at The Cardinal Hotel? How about Winston-Salem? If not, what’s the first thing you’d like to do here? We’d love to read your answer in the comments section below! This post originally appeared on our sister site NC Tripping, and is a part of our blog‘s series on North Carolina travel. It is also a part of our Hotel Guides series. There, we’ve featured places to stay, including Proximity Hotel in nearby Greensboro, Hyatt Place in Charleston, South Carolina, and more! Complimentary accommodations and meals were provided by The Cardinal Hotel. No other compensation was received for this review. This post reflects the honest opinion of our experience without outside influence.